J. Peder Zane is the Book Review Editor and Books Columnist for the Raleigh/Durham News & Observer, positions he's held since 1996. He's also edited two of my personal favorite books on books: Remarkable Reads: 34 Writers and Their Adventures in Reading and The Top Ten: Writers Pick Their Favorite Books. The Top Ten is his latest book. It features a collection of the top 10 favorite books of 125 outstanding contemporary writers. Not only is it a great resource, but it's also fascinating to see what's influenced both your favorite writers and writers you may not have "met" yet. These lists are really somewhat revealing, more so than you might think. Authors I previously thought I had nothing in common with turned out to share some of my favorite books. That could lead a girl to re-evaluate things a bit. 1. What inspired you to create 'The Top 10'? How long did the process take, start to finish? We have the great fortune to live in an age when almost every book that’s ever been printed is at our fingertips. Mega-bookstores such as Barnes & Noble, online retailers like Amazon.com, and better communication among libraries seem to offer a reader’s paradise. However, choice can create confusion, possibly paralysis. When anything’s possible, it can be hard to know what to do – what to read. Folks such as Oprah and Don Imus have had such success recommending books because people are desperate for guidance. While they have made solid picks, I wanted something more. I asked myself: who can give the best advice? The answer, of course, was great writers. While intriguing bibliophiles - who will get new insights into the writings of Norman Mailer, Tom Wolfe, Annie Proulx, Joyce Carol Oates, Stephen King, Michael Connelly, Alice Hoffman and the other contributors by seeing what they read — I believe “The Top Ten” will prove especially useful to book club members looking for satisfying suggestions and librarians and bookstore folks eager to turn readers on to great works in a variety of genres. 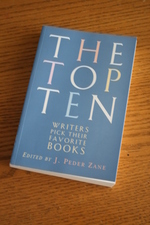 I also hope that readers will compile their own top ten lists – so far more than 140 readers have posted theirs at my website, www.toptenbooks.net. This exercise is fun and informative as it really pushes you to think about what you like and why you like it. Though some people are intimidated by the idea, concerned that others will judge their intelligence by their picks, the one thing the writers make clear through their 544 picks is that there are no right or wrong answers. Great books are the books that mean the most to each of us. I started “The Top Ten” in 2004, after the publication of my first book, “Remarkable Reads: 34 Writers and Their Adventures in Reading” (W.W. Norton). 2. How complicated was it to wrangle lists out of this number of writers? What was the most challenging part of the project? I worked almost exclusively through email, sending letters through extremely helpful publicists at various publishing houses. Then I’d wait! I’d only send a few letters out at a time, Each time someone said yes, I’d add their name to the “participating writers include” section of my letter. As that list got longer, my success rate went up. Most of the writers were more than happy to provide the lists, though they found my simple request to be quite complicated. Their enthusiasm about the project was my first sign that the book would fly. Some of the authors were concerned about picking just ten books – the great Mary Gaitskill has an essay in “The Top Ten” addressing that issue. I assuaged (almost) all of them by noting that while I was limiting each of them individually, it was in the spirit of a remarkably inclusive project. At the end of the day, the 125 writers named 544 different books – an average of four unique titles per book. And there’s another inspiration for “The Top Ten” – to have a book filled with hundreds of other books each of which is considered by at least one distinguished writer to be among the ten greatest works of fiction ever published. 3. Were you an avid reader as a child? What were your favorite books? My dirty little secret: I didn’t read much as a child. I was, shall we say, an “active child” (i.e. a rowdy pain in the neck). I became a reader in high school. If I liked an author’s works I’d keep reading him/her. My first loves were Faulkner, Hamsun, Austen, Kawabata and Wodehouse. 4. Who are your favorite contemporary writers? In all honesty, I love the 125 writers who contributed to “The Top Ten” – that’s why I asked them to be in the book. “Henry and Clara” by Thomas Mallon made my person Top Ten list and “Cloud Atlas” by David Mitchell is one of the best books I’ve read in the last five years. If you put a gun to my head and said “name one living author who rocks your world” it would be Pynchon. 5. What are you currently reading? Anything you'd recommend? As a member of the board of the National Book Critics Circle I’m reading all 30 finalists for our awards, which we will announce on March 8. Two finalists in the memoir are extraordinary: “The Lost,” in which Daniel Mendelsohn recounts his search for memories of six family members murdered in the Holocaust, and “Strange Piece of Paradise,” in which Terri Jentz tries to find the man who nearly murdered her and a friend in a random act of brutal violence in 1977. 6. What projects are you working on now? I edit the Book Review section and write a weekly column on books for The News & Observer of Raleigh, N.C. That’s keeping me busy as I try to figure out my next book. 7. As a public library employee myself I have to ask, what role have libraries played, throughout your life, in your love of books and reading? It was my high school librarian who sparked my love of reading. She was always handing us books, promising us we’d love them – if we’d only give them a chance. Often I didn’t. One day I did. And that, as they say, made all the difference. Today, the library is working the same magic for my three daughters who are, blessedly, getting an earlier start than their old man. My thanks to J. Peder Zane for taking time out of his busy schedule to answer my interview questions. Iliana, have you read the other book Zane edited, 'Remarkable Reads'? I realized I actually have this one here at my library desk, hidden away in the shelf right above my head. It contains essays written on specific reading topics such as: "The Most Memorable Book That I Read," "The Hippest Book I Read," etc., each written by a different writer. It's also a wonderful book. Great interview. I've visited the Top Ten web site a couple of times and it's fun to read the lists readers have submitted. Perfect way to find books to add to the ever growing list of books to be read. Andi, my husband's flying home from Raleigh today, coincidentally, after a business meeting he had out there. I've instructed him to search out the newspaper for me so I can have a look at it. Online is okay, but there's something about having the real, paper copy of a newspaper. Fay, I've been thinking about all sorts of potential top tens. I need to get myself organized and do some of them. For one thing, there's "Top Ten Books I Fell Asleep While Reading," which I should probably try to restrict to authors no longer living. They tend to be less offended. What a delightful interview. And I'm ashamed to say, not once did I pick up the Raleigh/Durham Observer when I lived a mere 45 minutes from Raleigh. Shame on me. I can't wait to lay my hands on this book. I'm a sucker for lists. Bluestalking Reader, this is definitely my idea of fun. I've been playing around with this book in various ways. Today I came up with some lists of my own, posted on Historical / Present, based on Zane's numbers: Top Ten Books by Women Authors and Top Ten Books in Translation. There are 2 books each by Jane Austen & Virginia Woolf, and the Russian classics dominate the translations.